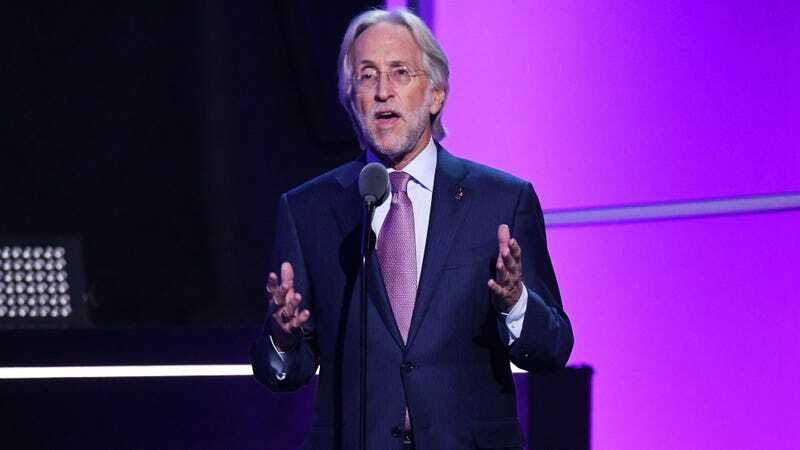 The Grammy Awards head/Recording Academy chief? The man who kicked off 2018 by responding to criticism of his antiquated institution’s lack of diversity with the asinine assertion that if women want to be awards-worthy, they need to “step up”? In February, just days after the 2018 Grammy Awards came and went, Portnow announced the Academy would launch a task force to review “where we can do more to overcome the explicit barriers and unconscious biases that impede female advancement in the music community.” Details of how this would work or even what it would do to accomplish its goal did not exist; artists and music industry heavyweights called on him to resign. Perhaps their anger worked because, per the Hollywood Reporter, Portnow has announced he’s stepping down next year. Bye!!! THR reports that Portnow, who has held the title of Recording Academy CEO since 2002, has a contract which expires next year—and it won’t be reinstated. There are a lot of factors potentially responsible for Portnow’s impending retirement, but let’s be sure to note the efforts of powerful women in the music industry: In February, executives from several major labels signed a letter criticizing Portnow’s harmful language, demanding he resign; signees included Michele Anthony, executive vice president at the Universal Music Group; Jody Gerson, chief executive of Universal’s publishing arm; Julie Greenwald, co-chair of Atlantic Records; Sylvia Rhone, president of Epic Records; Julie Swidler, general counsel of Sony Music; and Desiree Perez, chief operating officer of Roc Nation. At the beginning of March, Tina Tchen, who previously served as Chief of Staff to former First Lady Michelle Obama, was placed in charge of Portnow’s Grammys task force. As my coworker Hazel Cills pointed out, Tchen had previously assisted in setting up the Time’s Up Legal Defense Fund and acted as the executive director of President Barack Obama’s White House Council on Women and Girls. It’s pretty astonishing that it’s taken this much to get Portnow to retire, but what’s done is done. Goodbye forever!!! Should Women &apos;Step Up&apos; at the Grammys, or Just Step Away Entirely?